An in-depth look into working with a designer. Deciding to work with a designer is a big step in building your business. A well-designed brand can take you from amateur to pro and help bring in business. Deciding to hire a designer can also be an overwhelming task. While I can’t speak for every designer I decided to write a post on what it’s like working with a designer (specifically me.) Understanding the process before you begin will help ease your mind and answer any questions you might have. Having this info in a PDF is easy to send over ASAP. If they reply back and let me know they are interested in getting started then the on-boarding process begins. The on-boarding process might be the least exciting part of working together however, it’s crucial. After figuring out what it is you need from me (branding, website design, etc) I will put together a contact through the online software I use, Hello Bonsai. The contract is designed for you and your needs and is easy enough to read and understand. After signing the contract online the first deposit invoice is sent to you. 50% is required upfront so I know you are serious about working together and covers me in case a client decides to bail half way through the project. The invoice is paid using a credit card or Paypal. After the contract is signed and the 50% deposit invoice is paid we move on to the client questionnaire. I put together the client questionnaire to get to know my client’s business and their likes and dislikes when it comes to design. This allows us to make sure we are on the same page which will make the process not only easier but will cut down on refinements and back and forth emails. The questionnaire is around 10-15 questions. What fonts, colours, and design elements are you not a fan of? What are three brands you love and why. After you’ve filled out the questionnaire I’ll spend some time going over it and will reach out if I have any questions or concerns. I like to allocate a week at most to the on-boarding process however, each client is different and sometimes it only takes a few days. The design phase is obviously my favourite part of the process and should be yours too ;). The first thing I do is set up a secret Pinterest board and invite you into it. It’s here I’ll ask you to pin at least 20 images of other designs you like, colours you are drawn to, other brands you love, etc. Having this inspiration really nails down what you like and don’t like which in return makes my life a whole lot easier. I want to make sure I’m designing a brand that fits your needs so the Pinterest board is a crucial part of the process. After you’ve finished pinning I will put together a moodboard that includes a few of your pins and I will add in a few of my own pins that I think will fit your brand needs. If you find the pins I added don’t work for you we will refine it until it’s perfect. The moodboard will set the overall tone of the project. 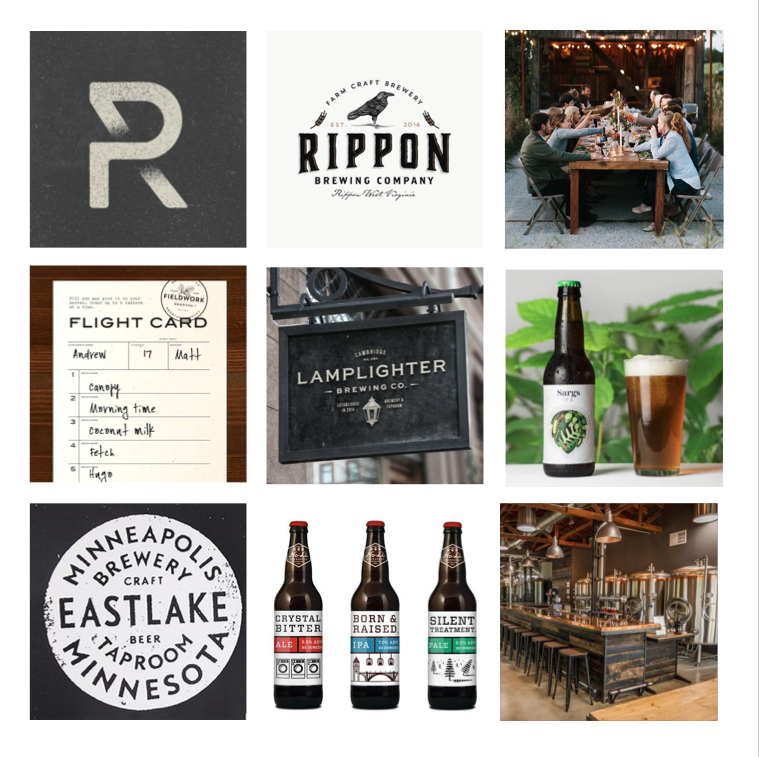 Below is an example of a moodboard I created for Catapult Brewing here in Toronto. Next step is to begin the logo design. I typically design 2-3 logo options that I feel fit your business best. This process usually takes 1.5-2 weeks. After I’ve designed a few options I’ll send over the concepts laid out in a PDF. I love to place each logo on a few different mockups (business cards, stationery, etc) to give you a better idea how the logo looks used on different brand elements. With the logo options presented my clients choose one that they feel fits their business best. If any refinements need to be made to make the logo we will work together to finalize the perfect logo. Secondary logo marks are the perfect companion to your primary logo. They are used when your primary logo cannot be used due to space restrictions or just a different on your brand elements. It’s important that your secondary logo marks still look and feel connected to your primary logo so I generally like to use the same style and fonts, just laid out differently. I like to give my clients a couple of options for their secondary logo marks. They can choose to use and keep all of them or work to refine a specific one. Colour plays a huge part in a brand. Randomly picking colours because you like the way they look is a huge mistake when designing a brand. A colour palette needs to be carefully crafted in order to portray the correct mood and feel of a business. I like to keep my clients colour palettes to at most 5 colours and then include the shades of each colour to expand the palette a bit more. It’s important to note that the fonts I use in my clients logo are not necessarily included in the font palette. I believe your logo should stand out and doesn’t necessarily need your brand fonts used in it. Because a lot of my clients have an online web presence I like to make sure their header and body copy fonts are also available as web fonts. Some clients are more than happy to spend extra money on a web font and some clients are perfectly fine using free web fonts from Google fonts. A lot of care goes into selecting a font palette. After the above is finished we then move on to creating any necessary brand patterns and graphics to include in the clients brand package. Patterns are great for applying to brand elements such as business cards, menu designs, merchandise, packaging design and more! Graphics include icons and illustrations that might be used in your logo or used on their own on brand elements. Last but not least my Full Brand package comes with three brand collateral items! Once my client has their new brand built it’s time to show it off. It’s my clients choice to decide what they want designed. It’s now time to celebrate! After everything is complete and approved by you we begin the project wrap up phase. My Full Brand clients receive a brand guide included in their final files. A brand guide is a PDF that includes how to use your new logo, what to avoid, colour codes, font names, graphics, and more. A brand guide is perfect to make sure your brand is kept on track when working with other designers or companies. If you are ready to work with a designer I’d love to help. Fill out my form below and let’s get the design party started!